During a visit to the Golvanta Primary School, Golvanta, Gujarat we met an energetic but shy child Mayur Kanaji Thakor. A bright and sincere student, he likes playing and his favourite subject is Gujarati which also happens to be his mother tongue. Mayur wants to grow up to be a doctor. Mayur comes from a family of four with his father as the sole breadwinner with a monthly earning of Rs. 6,000. His mother is a homemaker, and his younger brother is a student in the same school and an Akshaya Patra beneficiary. Akshaya Patra’s mid-day meals are popular in Mayur's school and he loves the food too. On being asked about the taste, he couldn't just resist himself telling us about his favourite food served at school, which is Dal-Dhokli. He says, "It is hot and tasty!" He adds "I only have khichdi and sabzi when I go back home and that's all." Not-so-privileged economic background is indeed a hurdle but Mayur has not let it become an obstacle in his aspiration. 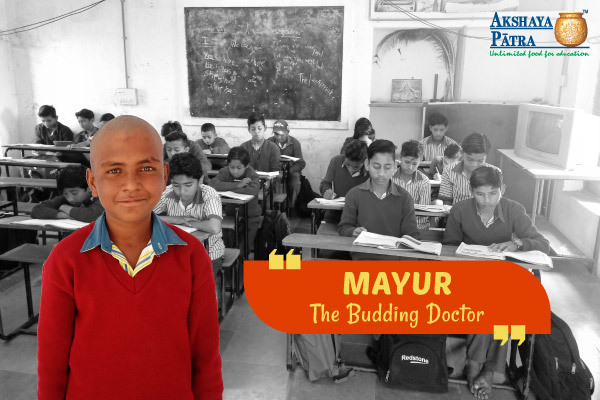 With Mayur's expression of words, it was evident that the 'never-give-up' attitude of this child will help him soar high in life. We wish him all the luck for a bright future!